4.5 stars I was fortunate to meet Rebecca Makkai last year, when she did a reading in Atlanta of her novel The Hundred-Year House. That was one of my favorite books in 2014, so I was delighted to see her first collection of short stories come out in June. 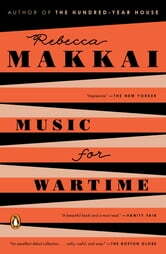 While I believe Makkai is a stronger novelist than she is a short story writer, this is not to denigrate the stories in Music for Wartime, but to recognize the high bar she set for herself with The Hundred-Year House. With the exception of "A Bird in the House," the seventeen stories in this collection are good, and five are excellent. I don't know whether the author or the editor is responsible for the order in which stories appear in an anthology, but the decision to open with "The Singing Women" and close with "The Museum of the Dearly Departed" was brilliant. Although "The Singing Women" is one of the shortest in the book, and I saw the ending coming, this tale of three old women keeping alive the memories and songs of a war-ravaged village is the emotional equivalent of a jab to the stomach and sets the tone for the remainder of the collection: a sometimes disorienting blend of hope and despair, both an elegy for the victims of conflict in all its forms and a celebration of the human will not only to survive, but to remember and bear witness. The next story, "The Worst You Ever Feel," about an elderly violinist's performance after decades of imprisonment, grabs the reader from its opening line: "When the nine-fingered violinist finally began playing, Aaron hid high up on the wooden staircase, as far above the party as the ghosts." What happened to the violinist's tenth finger? Who are the ghosts, and who are they haunting? Makkai provides the answers to these questions through the consciousness of a (perhaps clairvoyant) young boy, himself an aspiring violinist, and this unusual perspective leads to some unexpected insights. Other 5-star tales can be found in "Other Brands of Poison" and "Good Saint Anthony Come Around." By far the most challenging story is "Exposition," which takes the form of a transcribed interview with two men who attended a concert at which something (what?) happened. We are only given their answers, not the questions to which they are responding, and some words have been redacted, making it difficult upon first reading to decipher the identities of the speakers or the event they are describing. "Exposition," however, is one of those rare stories which benefits from - nay, demands - re-reading. With the second and subsequent readings, the power of the music suffuses the words of the story, making the reader long to have heard the concert itself despite its unhappy resolution. Music for Wartime closes with another 5-star read, "The Museum of the Dearly Departed," in which a woman learns more than she bargained for when she inherits the apartment of her fiancé, who died in his sleep from a gas leak in the building. The ending (you'll have to trust me on this until you read the story for yourself) could not be more perfect, for both the story and the collection as a whole: "Both of them were singing now. Dear God, what was that? What was she meant to do with that? Both of them were singing." Makkai is clearly experimenting with the short story form, and her forays into fantasy (such as "Couple of Lovers on a Red Background") are not particularly successful. 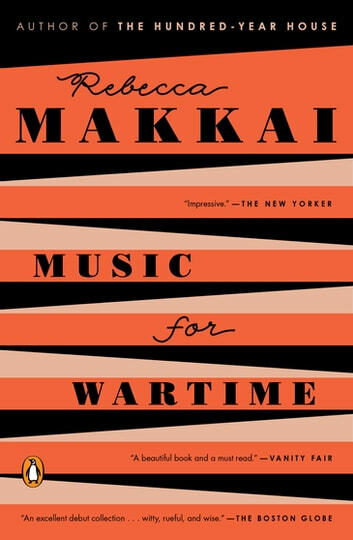 Overall, however, Music for Wartime is an impressive collection which I heartily recommend (although you definitely should read The Hundred-Year House, too!). I received a free copy of Music for Wartime through NetGalley in exchange for an honest review.